Martin was born in November 1966 into a family of musicians, both his mother and father being accomplished pianists. He began piano lessons at the age of 9 and started studying the trumpet at the age of 11. Four years later Martin became a member of the National Youth Orchestra of Great Britain and remained there for 3 years, playing a varied program of large orchestral works with some of the worlds leading conductors. In 1985 Martin gained a place at the Royal Academy of Music in London to study classical trumpet and Jazz graduating after three years with a G.R.S.M hons degree and an L.R.A.M. In 1989 Martin was invited to study at Berklee college of music in Boston, before returning to London to finish his studies at the Guildhall School of Music with a one-year post graduate course in jazz and studio music. During the last 12 years Martin has also recorded, performed live and toured extensively with various pop artists including Sting, Jamiroquai, Natalie Cole, Paul Young and the Brand New Heavies. 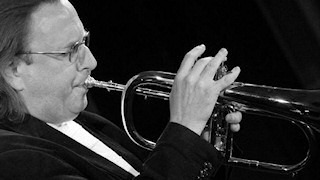 In 2001, Martin was appointed professor of Jazz Trumpet at the Birmingham Conservatoire, a faculty of the University of Central England. He recently toured with French artist Patricia Kaas.